2 Department of Management Studies, Indian Institute of Science, Bangalore. Rapid urbanisation in India has posed serious challenges to the decision makers in regional planning involving plethora of issues including provision of basic amenities (like electricity, water, sanitation, transport, etc.). Urban planning entails an understanding of landscape and urban dynamics with causal factors. Identifying, delineating and mapping landscapes on temporal scale provide an opportunity to monitor the changes, which is important for natural resource management and sustainable planning activities. Multi-source, multi-sensor, multi-temporal, multi-frequency or multi-polarization remote sensing data with efficient classification algorithms and pattern recognition techniques aid in capturing these dynamics. This paper analyses the landscape dynamics of Greater Bangalore by: (i) characterisation of direct impervious surface, (ii) computation of forest fragmentation indices and (iii) modeling to quantify and categorise urban changes. Linear unmixing is used for solving the mixed pixel problem of coarse resolution super spectral MODIS data for impervious surface characterisation. Fragmentation indices were used to classify forests interior, perforated, edge, transitional, patch and undetermined. Based on this, urban growth model was developed to determine the type of urban growth Infill, Expansion and Outlying growth. This helped in visualising urban growth poles and consequence of earlier policy decisions that can help in evolving strategies for effective land use policies. Profitability and environmental responsibilities go hand in hand for most modern businesses. Since an organization future increasingly depends on its environmental sustainability, it is vital to equip the organization with a new frame for environmental compliance. Mobile technologies, due to theiranytime, anywhere abilities to communicate, can play a significant role in creating a sustainable future by increasing social and economic opportunities for businesses to be environmentally compliant. This paper presents and extends a corporate Environmental Responsible Business Strategy (ERBS) that brings together mobile technologies and business responsibilities, resulting in an Environmentally Intelligent (EI) business model. Over the last few years, the demand for multimedia communications and adaptive video streaming over a hand-held wireless terminal has grown leaps and bounds. The data-rate required for providing such services is of the order of hundreds of megabits per second (Mbps), which in turn results in high power requirement at both the transmitting and receiving wireless device. However, a wireless terminal is an energy constrained device, and therefore, the battery power cannot be increased indiscriminately. Hence, scientists across the telecommunication world have been focusing on devising architectures and algorithms for conservation of battery energy, while designing link adaptation techniques for wireless systems. Lately, game theory has emerged as a very promising method to tackle the energy issue in next generation cellular networks. In this paper, a novel game-theoretic method is investigated for a third generation (3G) Universal Mobile Telecommunication System (UMTS) cellular architecture, wherein, the transmitter power and the adaptable code-rate constitute the action set of players. The utility function is designed in order to achieve the dual goal of maximizing the system throughput and at the same time, minimizing the power consumption of each wireless device in the network. It has been found that the game-theoretic model with a modified cost function leads to a much better solution than the one with fair scheduling or a greedy approach. The telecom companies around the world use software known as OSS and BSS which is an important component of the telecom industry today and its licensing models pose a challenge not only to the telecom service providers but also to the new software vendors entering this market. There are big vendors who deal in the OSS domain and provide an end to end solution to the problem faced by their customers. The licensing policies that these firms use for pricing their services are often hostile for the small service providers. The paper discusses the current situation of technology of the telecom vendors and how the software industry has been instrumental in solving the problems of operational efficiency faced by the telecom sector. It also shows the current trends in the license model being used by these providers and the viable alternatives provided by advent of newer business models like SaaS and technological advancements in open source and web 2.0. In this paper, we propose a novel technique for information-driven architecture for routing in Mobile Wireless Sensor Networks that guarantees energy efficient routing in network architecture and allows the idea of fine-grained sector localization. The key idea was to hierarchically partition the sensor field into levels of increasing signal strength and also angularly partition levels into sectors of increasing angular measure. Then we develop a passive, directional localization algorithm where each node must be aware of its position and orientation relative to the network. This variant is especially relevant for the applications in which mobile nodes are required to move in a collaborative manner. The logical reasoning is that it is sufficient to know a particular level of sector where the event has occurred, instead of knowing the precise position of each and every sensor node in the network. Sectoring Based Levelling and Directional Localization techniques are combined to form a novel hybrid Localization solution called LSLR (Levelling, Sectoring, Localization and Routing). Sectoring introduced in levels, benefits in terms of data aggregation and data filtering and reduces power and traffic throughout the network. Our approach when applied in the network increases the life time of the network and it also helps to improve the successful transmission of data packets. We show that compared to existing solutions, such as levelling, gossiping, directed diffusion level controlled gossip, our approach is energy efficient and it even outperforms other existing algorithms. These Actual business leverages on software service to improve general firm performance. Software is always more a strategic asset to sustain business. In meantime business is changing continuously: there is a transition from centralized to distributed and cooperative organizations. This work describes a software maintenance process strictly integrated with enterprise evolution. It starts from the basic hypothesis that the software service model has to be integrated in the process of define/improve business models at run time and not in a separate step. This means paradigmatic changes: from top down maintenance and control to a bottom-up evolutionarily life cycle where software assets maintenance is integrated with organizational assets maintenance. The benefits of the model are measured reduction of the number of defects on high level requirements and the incremental commitment nature of the process: expenditures tend to be balanced with certainty level. Power Generation is a very important factor for any country either developed or developing. Growth of the country depends on efficient and sustainable power generation management. In this paper an attempt is made to analyze the efficient scheduling of Power Generators, which will increase the output in terms of its present input. As Load forecasting is the deciding factor for efficient generation scheduling of generators, which in turn benefits electrical power company. Previous data of power generated on the same days of weeks, months and years are used for Data Mining and hence Business Intelligence is derived for scheduling of generators. Data Collected from one Power Company is used for analysis, tools used for analyzing are engineering tools which give better results. This paper presents a multicriteria analysis approach for evaluating and selecting e-markets in conducting organizational business-to-business e-business. The multi-dimensional nature of the evaluation and selection process for choosing the most appropriate e-market in developing organizational business-to-business e-business is handled in the context of multicriteria analysis, the subjective ness and imprecision of the human evaluation process is modeled with the use of pair wise comparison represented by linguistic variables approximated by triangular fuzzy numbers. An efficient algorithm is developed for producing a success index for every alternative e-market across all selection criteria, on which the selection decision can be made. An example is presented for demonstrating the applicability of the proposed multicriteria analysis approach for solving the problem of selecting the most appropriate e-market in a specific situation in order to develop a successful business-to-business e-business in an organization. Nowadays governance is used as a buzzword for just about everything. It seems that the world can no longer live without it. Up to a certain extent this is true. Over the past couple of years, the concept of governance has become increasingly important. This is mainly the result of the fraud scandals of Enron, WorldCom and the very recent one and closer home Satyam and many others. These incidents have brought about an enhanced attention to enterprise (corporate) governance. Consequently, IT governance is also on the agenda as, both corporate governance and IT governance focus on related issues, and IT governance performance greatly impacts the organisation ability to achieve its objectives.Currently, many enterprises are implementing IT governance structures, processes and relational mechanisms to achieve a better fusion of business and IT. A crucial question is how well are they doing? In other words, how do the implemented IT governance practices rate? 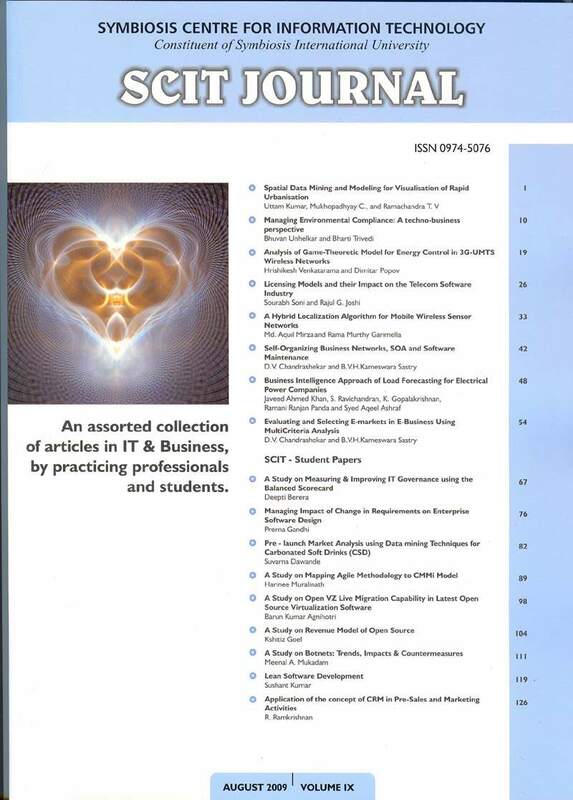 This paper aims towards studying the IT balanced scorecard as a way of assuring IT governance and achieving the integration of business and IT decisions. It will analyze how the IT BSC can be specifically customized to address IT governance issues. Situations in software design are made more difficult by the changes in requirements that invariably occur in enterprise software systems, even as the software is being designed and built. Requirements change request are liable to be acknowledged but what will be its impact on schedule and budget is not known precisely, the game of estimation is played purely on one experience. If this impact can be quantified, the information can be useful to the stakeholders, helping them in adjusting project schedule and budget. The iterative and incremental model provides an expedient framework for addressing such concerns. In this paper we evaluate the application of the metrics based techniques presented in  and  on an example system. Results from the study are presented as well directions of future work. New product development is vital for all companies. As the success of product launch depends on previous stages of development, there is a clear need to evaluate new product initiatives systematically and make accurate decisions under uncertainty. Another concern is the time pressure to launch new products due to the high competition in the market. This paper covers the pre launch market analysis of the new product with the help of data mining. It includes the assessment models and techniques that help the evaluators to make appropriate decisions for accelerating the decision process of what new product should be made. This research paper provides both a theoretical and a practical understanding of key data mining methods like frequent sets, association rules, classification tree which are used during pre launching of a new product. Using a real business case of pre launch market analysis of CSD it thoroughly explains the application and interpretation of these methods. Market analysis,data mining,new product development,classification tree,association rules,frequent sets. Software development organizations are increasingly interested in the possibility of adopting agile development methods. Organizations that have been employing the Capability Maturity Model Integration (CMMi) for making improvements are now changing their traditional software development processes towards agility. By deploying agile methods, these organizations are making an investment the success of which needs to be proven. This paper aims at discussing the compatibility and conflicts from a theoretical aspect and suggests some process improvements using Practical Software and System Measurement (PSM) and other practices for adoption. This way, it is felt that many practical hurdles can be minimised. Perception problems,Coverage of CMMi by XP,XP improvement approach,PSM & CBR,SCRUM best practices. Server consolidation has become an integral part of IT planning to reduce cost and improve Efficiency in today enterprise data centres. The advent of resource virtualization allows Consolidation of multiple applications into virtual servers hosted on a single or multiple physical servers. However, despite its salient features, this poses new challenges, including selection of the right virtualization technology and consolidation configuration for a particular set of applications. This Study will include understanding various Virtualization Techniques along with various examples .Firstly it will include understanding the Open VZ Technology, its components and concerned tools lists. Second part of my paper will include comparatively study between various types of Virtualization techniques with respect to various issues such as scalability and performance issues. Virtualization,Hyperviso,VMM- Virtual monitor Machine,Virtual Environment,Template,VPS- Virtual Private Server. Open source is always perceived as the distribution of the free software and its source code (so that the receiving party will be able to improve or modify it). The report includes the concept of various Revenue models used by open source vendors and identify challenge and issues they are facing. In this report I have tried to answer to few questions like: Indentifying the current revenue channels, and factor which differentiate different open source vendors; Analysis of trends in open source revenue models; Identifying the critical success factors for choosing an open source business strategy; Why a company might adopt an open-source model; How open-source licensing works; What business models might be usable for commercial open-source products and what special considerations apply to commercial products released as open source. The increase in usage and dependency on Internet is accompanied by a parallel trend of exploitation. The motivation that was earlier restricted to challenge, fame, revenge, gaining knowledge has considerably shifted towards financial gains. Subsequently, the technology used to launch such attacks has become very sophisticated. The mechanism of exploitation is now gradually moving towards widespread automated attacks. One such technology is. Botnet, a Robot network, is technology which is becoming a significant and deadly face of the threat landscape. A study indicates that about 40% of the world computers are infected and controlled by Bots. Botnets have the capability to infect, take control and make use of millions of computers as-how-and-when desired. Their usage has widely increased. This paper aims to uncover their evolution, typical lifecycle, various uses, technological advancements, trends, probable impact on security, detection mechanism, and countermeasures for preventing a Botnet attack. Botnets,Bots,Evolution,Technological advancements,Bot uses,Impact on security,Lifecycle,Bot detection/prevention,Bot business,Procuring-to-deploying a Botnet. Toyota and other top manufacturing companies have embraced, improved, and profited by lean production methods. In time, the abstractions behind lean production spread to logistics, and from there to the military, to construction, and to the service industry. As it turns out, principles of lean thinking are universal and have been applied successfully across many disciplines. Lean principles have proven not only to be universal, but to be universally successful at improving results. When appropriately applied, lean thinking is a well understood and well-tested platform upon which to build agile software development practices. Lean Software Development (LSD) is the application of lean principles to the craft of software development. Lean Software Development is not a management or development methodology per se, but it offers principles that are applicable in any environment to improve software development. The research intends to extend the functionalities of the concept of Customer Relationship Management to Pre-Sales. The research includes the detailed study of various CRM solutions available with respect to modules. The study also is extended to the core processes of Pre-Sales and Marketing functions. The study was limited to the Software Services Industry operating in Business to Business models. The research further continues with detailed study of a CRM tool. It also helped in aligning the Pre-Sales function with the CRM processes. The open source system SugarCRM was considered for a detailed study of the CRM process modules. The study emphasizes the need for a collateral management module as it is an important activity in a Pre-Sales function. A collateral management module is designed with templates enabling easier design of the collaterals. This module also includes a proposal management tool which would track the flow of the proposals between the Delivery and Sales and Marketing Functions. The inclusion of such modules would enable a Customer Relationship Management tool to perform Pre-Sales function. The point of concern for such incorporations would be an operational strategy for a seamless integration. The integration would require a module with technical factors which would be compatible with the existing CRM solutions. Hence, the utilization of open-source source systems would be important as the technical feasibility for the integration of the module would not depend on technical platforms. Moreover an open-source system is an effective idea in cost cutting endeavors of any organization.